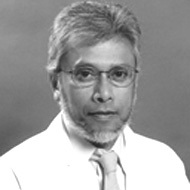 Jay Wimalasena is Professor & Director of Department of Ob/Gyn . He completed his PhD in Pharmacology from the University of Colorado Medical School, Denver, Colorado He have worked with various association and member of various reputed organisation. He enjoys family-life, reading, writing, music, basketball and golf.He is currently studying: (1) the molecular mechanisms of regulation of the breast cancer cell cycle by estrogens (including myco/phytoestrogens) specifically the regulation of Cdc25A, Cdk inhibitor p27 kip independently of G1 transit; (2) Apoptosis induction by paclitaxel etc. and the anti-apoptotic effects of Estradiol in breast and ovarian cancer cells at the molecular level. Elucidation of the role of Ras, PI-3K, ERK, AKT pathways in estrogen action on cell division and apoptosis.